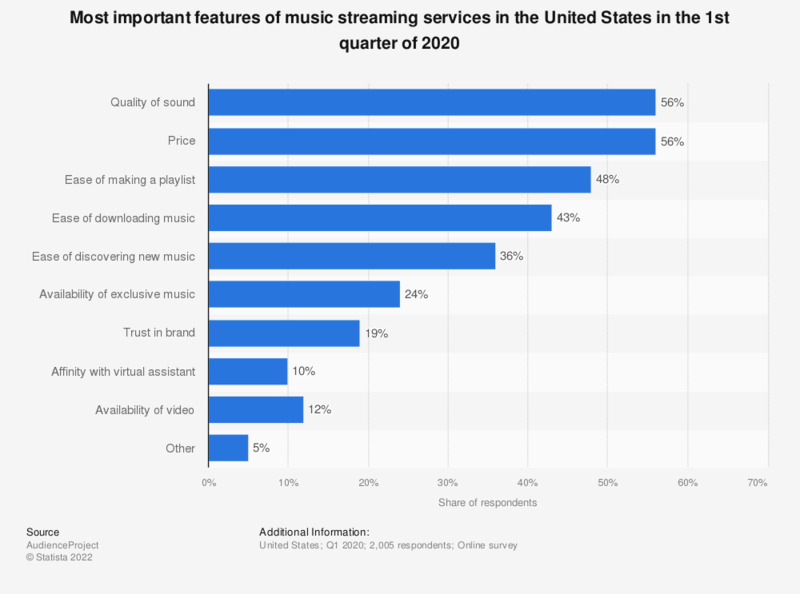 This statistic presents data on the most important features of music streaming services among adults in the United States as of March 2018. During a survey, 81 percent of respondents stated that the variety of music available was the most important feature of music streaming services. Everything On "Sirius XM" in One Document: Edited and Divided into Handy Chapters. Including Detailed References. Statistics on "Digital music in the U.S."
What is the most you would be willing to pay for a music streaming service without any ads? What is the most you would be willing to pay for a music streaming service with ads? Are you currently a member of Pandora? Do you have a personal or family subscription plan for music streaming services? Are you currently a member of Spotify? Which of the following criteria are important to you when choosing the service you use to access music?